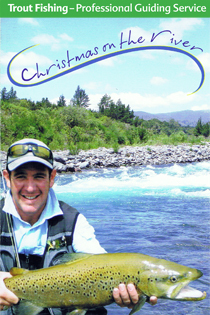 The Taupo fishery has been a world famous destination for anglers since Zane Gray wrote his "Tales of the Anglers Eldorado, New Zealand" in 1926. The Tongariro River is the focus for most who want to go fly fishing, and this river continues to produce great numbers of fine rainbow trout and a few trophy brown trout every year. There are rivers to suit all techniques, all levels of ability, easy access or total seclusion. The Taupo fishery has it all! Trout are designated as a sports fish in New Zealand, and a licence is required to fish for them. There are two licensing systems, Fish & Game which covers all of New Zealand except Taupo, and DOC Taupo Region which covers all of the Taupo fishery. Several options are available depending on how long you will be fishing for, as well as child and family licences. Licences must be purchased prior to fishing, and are available at most fishing and sports stores around the country. If you are using a guide or a charter boat then licences will usually be prepared for you. 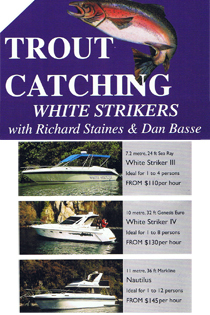 If you are coming to Taupo and traveling light, or want to try trout fishing for the first time, we can supply everything you need to get out on the water. Plus, we'll tell you where to go and what flies or lures are working now! With so many fishing options over such a large area, it's always a good idea to start your fishing holiday with a day with a fly fishing guide. They know what's working and where. Their years of experience fishing our local rivers ensures you'll have the best opportunities available on the day. Our guides will pick you up from anywhere in Taupo and provide all the equipment, so all you need to bring is a smile and enthusiasm! The Great Lake has excellent trolling, harling and jigging, and there is nothing more enjoyable than spending a day out on the water - especially if you hook into a few nice fish! Our charter boat operators all provide fishing in comfort and supply all the equipment and expertise to ensure you have a great day on the lake. 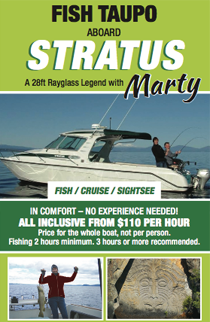 we have everything ready for your Taupo fishing adventure.